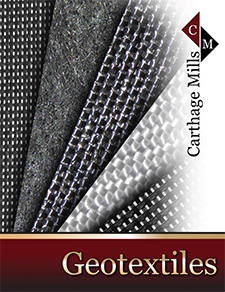 The Carthage Mills' FX®–MF and TF High-Performance Series of woven polypropylene geotextiles were developed to deliver the higher strengths and long-term performance that cannot be achieved by typical woven slit-film geotextiles. The FX®–MF and TF High-Performance Series of woven polypropylene geotextiles are produced of 100% high-tenacity polypropylene yarns. Utilizing a variety of unique weave patterns, they are designed for separation, stabilization and reinforcement, while still providing excellent filtration and drainage in a wide range of applications from moderate to severe site conditions. Whether the emphasis is on filtration, high tensile properties, and/or long-term performance, these versatile and durable geotextiles can provide quick and easy solutions to other costly alternatives. Carthage Mills' FX® High-Performance Series of woven polypropylene geotextiles are designed to provide cost-saving solutions in a wide range of applications and varying site conditions, making them one of the most complete and versatile lines of geosynthetics in the industry. SEPARATION and FILTRATION: Unique weave patterns prevent dissimilar materials from intermixing while providing free flowing drainage assuring long-term functionality of materials. STABILIZATION and REINFORCEMENT: High tensile modulus at low strains and excellent soil inter-action delivers immediate support in moderate to severe conditions. COST SAVINGS: When low-cost and high performance is combined, savings in structural materials and labor costs can be as much as 35-40%. Note: There are additional products in this Series that do not appear on the back of this Profile Sheet; see "Product Technical Data Sheets" below.